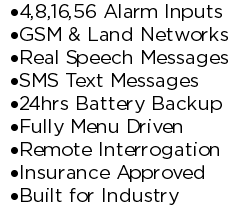 Auto Dialer Alarm Manufacturer We (Packs Infotel Ltd) have been manufacturing Alarm Auto Dialers since 1958. All our Auto Dialers are wholly made and designed in the UK using industrial specification components. Because we manufacture the equipment ourselves we can customize your unit to your exact needs including writing special software or creating new hardware.